I’m sipping some hot soy milk in an Ikari Coffe near Zhongxiao Station and thinking that I would’ve never be caught dead craving soy milk at 10 in the morning before coming to Taiwan. Now I find myself desiring it in any shape or form, cold or hot. Its just so damn comforting, although I haven’t abandoned my espresso demand. 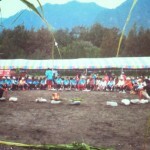 I’m going to visit the aboriginal village of Wulai today and I move accordingly. I take the MRT until Xindian station and then one of the local buses, the 849, the one I’ve learned to go to my girlfriend’s house near Gungshing. I know it takes about 35 minutes and 40 NT to get there and I end up giving directions to a young Turkish backpacker who was also going to Wulai. I learned has been through Russia, Siberia, Mongolia, Japan, South Korea and after a lot of recommendations by other travellers decided to pass by Taiwan on his way to the Philippines. He told me how much cheaper the food was here and how the knowledge of English was much better than in other Asian countries. I agreed, happy with my choice of travel. I left him on his way and stopped to meet my girlfriend and restock in fresh supplies for the trip. We pack some dry sweet roast pork and a snack that would disgust most of my fellow Portuguese, and I admit myself in the beginning. 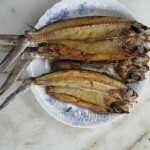 Dried fishbones with sesame seeds, which the Taiwanese eat like beer snacks. After some resistance I fully surrendered to its crunchy deliciousness. Soon we arrive at Wulai with some Taiwanese tourists and few foreign travellers looking to enjoy its famous hot springs and aboriginal culture. Its first Atayal residents (Editor’s note: “Atayal” is a term called by Japanese to Tayal people, who call themselves “Tayal” preferably), believing its waters to be poisonous, named it Kirofu Ulai, which means “hot and poisonous”. Unaware of that thousands of visitors looking for the therapeutic benefits of natural spring flock to this small village. After getting out of the bus I noticed how easy it is to get our way around the city by foot, with various indications and maps in English. We slowly walked into the old Wulai Street where various vendors expose their different aboriginal tastes and crafts. I came here to learn more about aboriginal culture so after crossing a beautiful small bridge with indigenous red and black padrons I stumbled into the Wulai Atayal Museum where a very polite employee proceeded to make us a complete tour. 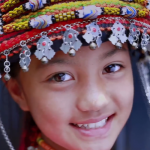 The Atayal people are the second largest group of indigenous in Taiwan, making up to 23% of its total population. 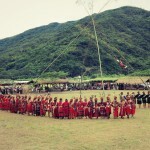 The Atayal in Wulai believe to be descendent of the first Atayal couple who appeared when a huge stone called Pinspkan broke in two. The descendents of that couple evolved into the Atayal, who began migrating north from the center of the island until they reached Wulai. The museum is free and thoroughly organised, with really nice dioramas of boar hunting techniques, wooden houses replicas, photos, traditional utensils in bamboo or hemp and makes sure no aspect of Atayal culture goes unexplained. What impressed me the most without a doubt where the tattoos and headhunting habits. 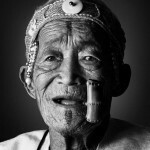 In Atayal society’s tattoos were very important, a baby would be tattooed to show that it was human and not an animal and later tattoos were added to represent the coming of age. Every member could have their forehead tattooed but in order to get their chin inked a woman would have to become skilled in weaving while men could only get them after doing some successful head-hunting. Hunting for heads was a generation strong Atayal customs, getting an enemy head would guarantee entrée to the afterlife and strengthen his ancestors. After the Japanese occupation many Atayal costumes were forcibly abandoned, including headhunting. This forced colonisation led to a rebellion in 1930, the Wushe incident, where Seediq, one of the Atayalic subgroups but is different from Atayal in languages and customs, uprised and killed 130 Japanese and later suffered almost total annihilation by the Japanese Armed forces. This event is depicted in the Taiwanese movie Warriors of the Rainbow, and while watching the many steel swords on display in the museum I felt relieved such custom was abandoned and my pale foreign neck wasn’t at stake any more. I guess after learning so much about Atayal animal hunting we got hungry for some aboriginal dishes, something not hard to find since the aboriginal restaurant Taya Popo was right at the corner. We ordered some traditional sticky rice cooked in bamboo shoots, mountain vegetables and fried river fish and shrimp for two people including a rice of millet wine, a very common Atayal drink. Food prices in Taiwan don’t cease to amaze me by the positive, as the entire meal was delicious and coasted only 7 euros. Unfortunately I wasn’t daring enough to order the more expensive boar or the more exotic larvae with seaweed, although a fellow foreign traveller in another table dipped into it with no delay. The main street is filled with stalls and shops selling authentic and less authentic Atayal products. From what I observed, Atayal descendants from the area seemed to have different facial features than other Chinese descendants, they seem to have a tanner look with rougher features, similar to the Maoris in New Zealand. On the way we bought some fresh mountain bubble tea and crossed Lansheng Bridge where you can see the hot springs where people do their therapeutic bathing. It’s easy to differentiate the darker river waters from the hot springs transparent and odorless water. Although the day started with a threat of unforgiving heath in Taipei, it was now mild and fresh as we crossed the river In Lansheng bridge to get to the little electric tram that by 50 NT takes you to the Wulai waterfalls. It used to be used to transport lumber and after only 1km of a clanking and shaky fun ride with an old feel, we were in the waterfalls looking amazed at the impressive brute force of the water dropping from an 80 ft fall, courtesy of the typhoon some days ago. After enjoying the scenery most people head to the Gandola, a huge sightseeing cable car that passes over the falls into the Yunhsien Amusement Park. However after zig zagging in the small house street stairs, passing shops with more touristic aboriginal products we decided to explore other trails and rented a bike next to the cable car station. They were perfectly maintained mountain bikes for 250 NT each, including a free bottle of water. It was almost 3 pm and we still wanted to explore the Neidong Forest Park so we started peddling next to Xinfu Road by the river. This bycicle ride was without any doubt the highlight of the day as we passed by an impressive scenery of cliffs and gorges surrounding the river, as imponent as the giant Atayal statutes placed in the way. Not one square inch of the cliffs wasn’t covered by lustrous forest and as we crossed a wooden bridge we headed into a smaller rock track in the other margin. Forests in Asia are really different from ones in Europe, they here seem to brim with life and noise. Every 5 meters it seemed there was another waterfall making their way down into the river as the biggest butterflies I’ve seen butterflies did crazy spins around us. All I could hear was the soft water rumble, toads and the sweet melody of my girlfriend complaining that she was tired. Bicycles arent’ allowed inside, so we had to walk after paying the 65 NT fee we entered the best conserved forest in Northern Taipei. There are few trails in the park, but they’re are all well signed with posts signs, leading you through its sweet-smelling cedar trees covered in moss, banana trees and populated by colourful birds and butterflies. The Nanshi and Neidong river come together on this area, creating many wonderful waterfalls, the most amazing for me the Xinxian Waterfall, which can be observed from three different angles. After reaching the highest platform, we had a really pleasant break in the wooden platform overseeing it and absorbing the purified fresh air coming from it. I felt sorry today’s strong current didn’t allow me to take a dip in its natural pools but really enjoyed how this valley created a fresh atmosphere thanks to its may water streams. Before the park closed at 5 we headed back, changing to Xinfu Road and started climbing the street in order to get back to Wulai village. After a pause for a bite on those scrumptious dry sweet pork snack and 10 mins of descending road we reached the cable car again and returned our bikes. We were fairly exhausted and while we crossed Wulai Old street again we couldn’t help having a bite of some barbecued moagi (Mata Taiwan’s note: sticky rice cake), mashed rice cubes in a stick with honey. Weird consistency is a constant in Asian cuisine, and this moagi wasn’t the exception. After taking the 849 bus again we finnaly arrived at my girlfriend’s house again where we were treated by a delicious home-made dinner of chicken with pepper and sweet onion, Segwa melon with shrimp and rib stew with carrots and white potatoes. My appetite is legendary but I still had some difficulties finishing all these treats. It’s a common Taiwanese table manner that every single grain of rice and food have to be meticulously scraped out of the plate. They even have a saying that if you don’t finish your plate, you’ll marry a girl with pimples. Luckily I had my precious Port wine to help me ease the chaos in my ever increasing happy curve. Taiwan has been good for her.